The vertebrate hindbrain includes multiple neural circuits that generate rhythmic behaviors including vocalizations. Male African clawed frogs produce courtship calls that are unique to each species, and differ in temporal patterns. In a paper published online 5/21/18 in the Journal of Neuroscience - and highlighted in Science and Nature - Biological Sciences PhD alumnus, Erik Zornik, and colleagues identified a class of hindbrain neurons that can account for the evolutionary divergence of song patterns between species. These neurons are part of the parabrachial nucleus, a hindbrain region implicated in vocal and respiratory control across vertebrates from lampreys to primates. 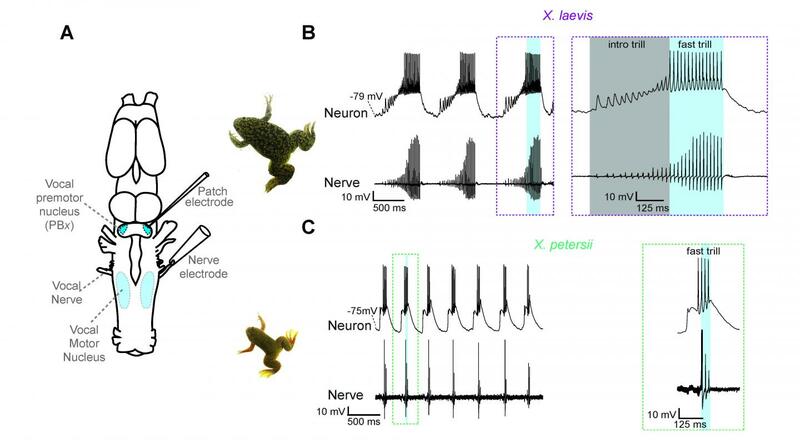 Changes to this group of neurons across evolution contributed to novel behaviors as Xenopus species diverged.